If your cataract isn't affecting you much, your optometrist can monitor your eye for a while to see how it progresses. They can also let you know if your vision is good enough to drive. If your cataract is more severe, your optometrist or GP can refer you to an ophthalmologist (eye doctor) to see if surgery will help you. When considering surgery, your ophthalmologist will want to know about your overall health and any other eye conditions such as glaucoma, age-related macular degeneration or diabetes damage. Cataract surgery is available through the public health system, and there's a points system to decide who can get it. You need to have a certain score to go on the waiting list for publicly funded surgery. The scoring is based on your vision, the effect your cataracts are having on your life and your general health. The score you need to go on the waiting list can change from time to time. Cataract surgery involves taking out the cloudy lens by making a small (keyhole) cut in your cornea at the front of your eye. The surgeon then replaces it with an artificial lens (also called an intra-ocular lens). The artificial lens can also correct any short-sightedness, long-sightedness and astigmatism you may have. Surgery is usually painless and very safe. You'll be able to go home the same day. 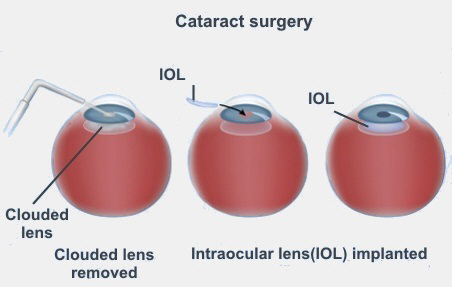 retained lens fragments (when the cataract isn't completely removed). But these risks are small when compared to the risk of leaving the cataract to get worse and cause blindness. Talk to your surgeon about how the risks relate to you. Have a balanced diet with a good mixture of different coloured fruits and vegetables. This gives your body the antioxidants it needs to be healthy. To make sure you discover any cataracts early, have regular eye examinations with an optometrist if you're over 60. Optometrists and your GP can refer you to an ophthalmologist (an eye doctor and surgeon) if you need to see one. Try this search if you wish to find an optometrist. Or you may want to pay to see a private ophthalmologist (eye doctor) in Christchurch, Nelson or Dunedin. Information provided by the Canterbury DHB. Adapted by the West Coast DHB. Last reviewed April 2018.